Click any icon and drag it to another location on the desktop. Alternatively, you can arrange all the icons by sorting them all at once. 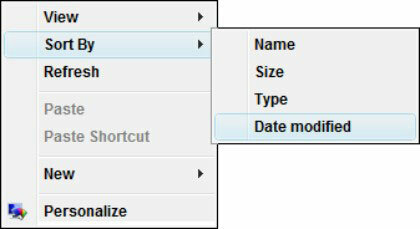 You can choose to sort by Name, Size, File Extension, or Date Modified. You can also personalize your desktop by automatically adding icons and folders to your desktop using the Desktop Icon Settings dialog box. 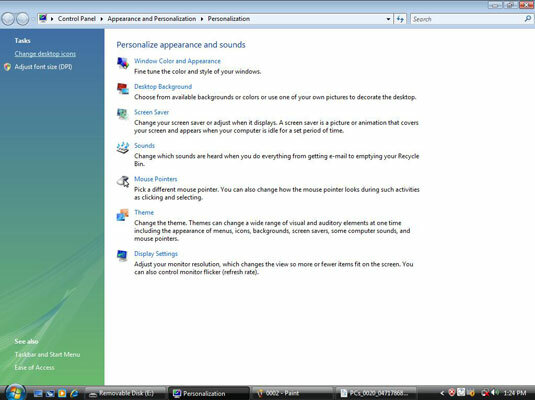 Right-click the Windows desktop and choose Personalize. Click the Change Desktop Icons link in the Task pane on the left. Select any of the Desktop Icons check boxes to automatically display shortcuts for those standard items. Click OK to save the settings and click Close in the top-right corner to close the Personalization window. You can also the icons themselves. Click the Change Desktop Icons link in the Task pane. 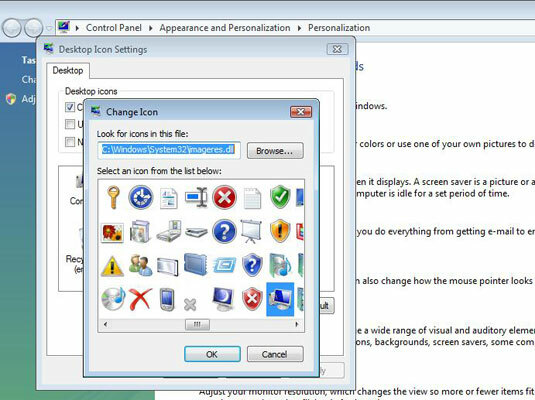 Select any of the Desktop Icons in the middle of the dialog box and click the Change Icon button. Click an icon that you like, and then click OK twice. The new icon you chose for the shortcut will now appear on the desktop. Be careful when using this feature: If someone uses your computer but isn’t aware that you changed the icons, he could click the wrong icon and potentially run a program that you don’t want him to run. 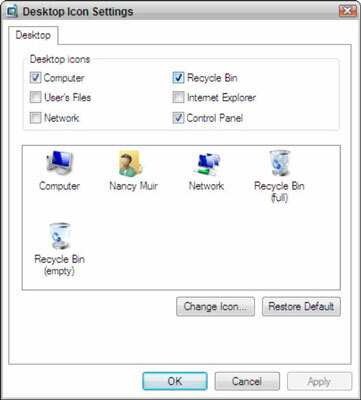 If you make changes and decide to go back to Microsoft’s original idea of a good icon for programs, click the Restore Default button in the Desktop Icon Settings dialog box.